Saturday’s episode of The Voice India was entirely dedicated to celebrating India’s Independence Day. Keeping this patriotic theme in mind, the audience were shown the special video that featured people from across India thanks to the popular #MyVoiceMyAnthem social media initiative. The two performing teams of this episode, were team HR and team Shaan. It was time for host Karan to announce the public voting results of team HR! Both Sachet and Deepesh were safe. Coach HR had to say goodbye to Anish who sang a few lines of a song dedicated to his mother. Anish received a standing ovation from coaches Sunidhi and Mika for this impromptu and emotional performance. Coach HR swiftly reminded Anish that he too, would be singing for him very soon. Host Karan, was then ready to announce the public voting results for team Shaan. Akash and Ritu were safe. Coach Shaan had to say farewell to Varsha. Then it was time to introduce the special guest of the evening who was none other than Daler Mahendi! Dalerji is also the elder brother of coach Mika. Dalerji entered singing ‘Vande Mataram’ with special acrobatic style dancers performing in the background. He then performed his most patriotic song (and everyone’s favourite) ‘Rang De Basanti’ title track. It was lovely to see the respect and love between coach Mika and his elder brother. Host Karan then passed the mike over to Meet Jain who was in the red room with the contestants! 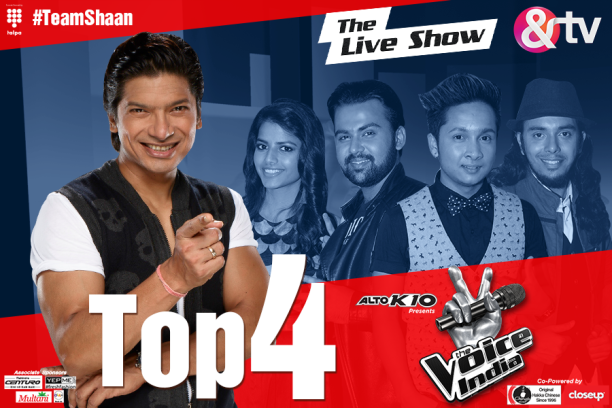 Team Shaan were first to perform with Pawandeep who sang ‘Maula Mere Lele Meri Jaan’ from Chak De India. Coach HR was very happy with the way Pawandeep began his performance and so he gave him a thumbs up for encouragement! Dalerji thoroughly enjoyed Pawan’s performance, while coach Mika said that Pawan made the song his own. Team HR were next with Sachet who sang ‘Rubaroo’ from Rang De Basanti. Coach Mika and the musicians provided backing vocals for Sachet. Coach Sunidhi gave Sachet a staning ovation for his performance and coach HR was so happy that he gave his infamous ‘Dhina Dhin Dha!’ moment! Host Karan then told the coaches that it is Sachet’s birthday in 2 dys! Coach HR said this time instead of giving another jacket, he has a lucky watch to give to the best performing contestant of the evening! Next on stage was Sanjana from team HR. Sanjana sang ‘Zor Ka Jhatka’ from Action Replayy. The original song has been sung by Daler Mahendi himself! Dalerji was very happy with Sanjana’s performance and coach HR noted that it is not easy to sing a Daler Mahendi song and that Sanjana has done extremely well. Back to team HR, and this time Piyush sang ‘Chunar’ from ABCD2. Piyush added some extra lines to the song dedicated especially to his mother. Coach HR was very happy with Piyush’s innovative performance. Piyush received a standing ovation from coaches HR, Shaan and Mika. To lighten the atmosphere, there was a special jugalbandi between coach Shaan, coach Mika and Dalerji. This included hit songs such as ‘Sawan Main Lag Gayi Aag’ and ‘Kardi Rab Rab Kardi’. Then back to the performances, Deepesh from team HR sang the angry song ‘Jee Karda’ from Badlapur. Deepesh received a standing ovation from coach Shaan and also a ‘Dhina Dhin Dha’ from coach HR! Team Shaan were next on stage with Ritu who sang ‘Beedi Jalaeile’ from Omkara. Ritu received backing vocals from coaches Mika and Shaan (!) Coach Shaan was very happy with Ritu’s performance and of course she was requested by the coaches to sing the song as she sings the original! There was full on fun and masti with coaches HR and Shaan whilst coach Sunidhi was singing! This was one of the best moments of the episode. Snigdhajit (team Shaan) was next on stage with the patriotic song ‘Ab Tumhare Hawaale Watan Saathiyo’. Sadly, coach Shaan was not happy with Snigdhajit’s performance as this was a difficult song to sing. Host Karan then passed the mike onto Meet in the red room who was with Pawan from team Shaan. Meet had a special surprise for Pawan as his friends had come to visit him! They sang ‘Yaaron Dosti’ together. Continuing the performances with team Shaan, Akash was next on stage with the song ‘Teri Meri Kahani’ from Gabbar is Back. Coach Shaan gave Aakash a standing ovation. Then it was time for the results of the coaches decision. Team HR were first and coach HR saved Piyush and Sachet. Sachet also received the lucky watch from coach HR! Team Shaan were enxt and coach Shaan saved Pawan and Akash.Saturday’s episode then ended with all the coaches singing a medley of songs with special guest Daler Mahendi. Sunday’s episode continued to celebrate the theme of Independence. Team Sunidhi and team Mika would be the performing teams of the evening. 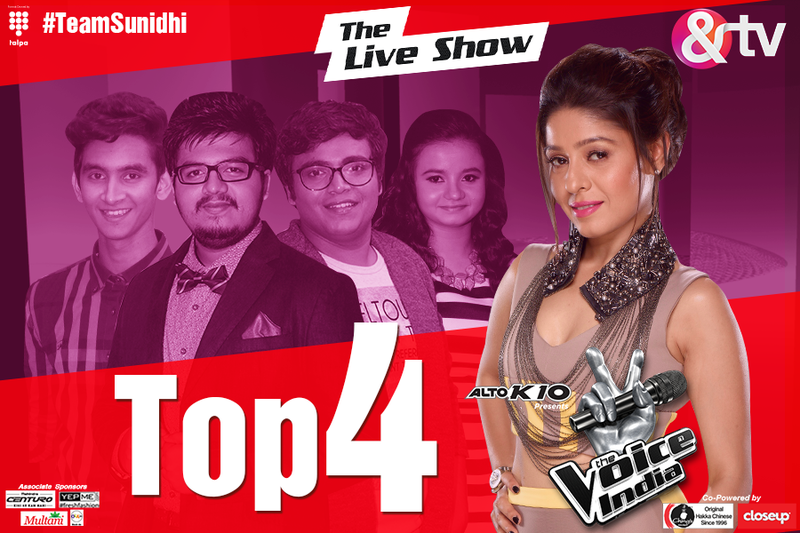 First up in the public voting results were team Sunidhi. Vishwa was safe and Shristi was safe. Oishwaryaa was eliminated. Team Mika’s public voting results were next and Passang was safe and Tanvir was also safe. Jyotica was eliminated. Jyotica also sang a special song that she dedicated to her Father before she left the stage. Team Sunidhi were the first to perform with Rishabh who sang a song of which I unfortunately do not know its title! It was a very slow, restrained performance. Rishabh received a standing ovation from coaches Sunidhi, Shaan and Mika. All three of them were very happy with Rishabh’s versatility. Team Mika performed next with Tanvir who sang ‘Mast Kalandar’ from Heyy Baby. Coach Mika was very happy with Tanvir as he said this is not an easy song to sing. Parampara (team Mika) was next to perform and she sang ‘Ye Tumhari Meri Baatein’ from Rock On. Coach Mika gave Parampara a standing ovation after which followed some very comic shayari from the fabulous four as Parampara was wearing a sari for the first time on stage. Coach HR said that Parampara had performed better in the second half of the song. 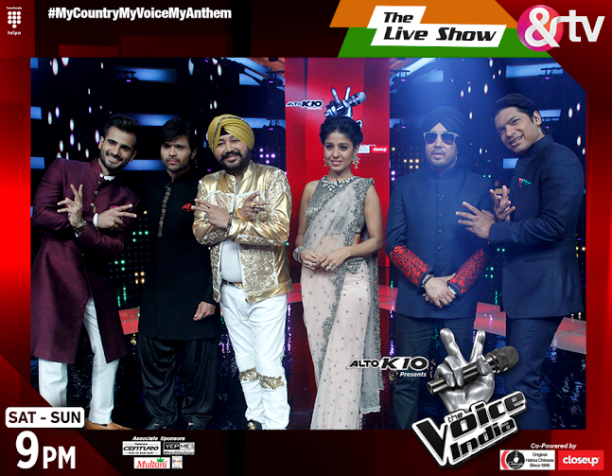 Team Sunidhi were back on stage with Vishwa who sang ‘Shayarana’ from Holiday. Coach Sunidhi was very happy with Vishwa’s performance whilst coach Shaan felt the scale could have been adjusted by half a note to aid Vishwa’s singing. Master Saleem then gave a special video message for Sahil Solanki in team Mika! Sahil was singing a Master Saleem song called ‘Awara’. He received a standing ovation from coaches Mika and Shaan. Coach HR gave Sahil a ‘Dhina Dhin Dha!’ and also the nickname ‘Tansen’. This was followed by some awesome Bhangra jugalbandi between coach Mika and Sahil and coach HR who danced to some Bhangra steps for the very first time! Team Sunidhi were next on stage with Parth who sang ‘Tadap Tadap Ke’ from Hum Dil De Chuke Sanam. Coach HR once again, gave Parth immediate encouragement after he had opened the song. Parth received a standing ovation from coach Shaan and coach Sunidhi was very happy! Coach HR especially sang his super hit song ‘Aap Ki Kashish’ from Aashiq Banaya Aapne and dedicated the song to Parth! Shristi (team Sunidhi) performed next with ‘Main Tumko Nahin Chodungi’ from Mardaani. Coach Sunidhi was disappointed with Shristi’s performance and coach HR felt that she should have been given a better song. Team Mika were back with Passang who sang ‘Chalo Tumko Lekar Chale’ from Jism. Coaches Mika and Shaan were very happy with Passang’s performance. It was then time for the results of the performances. Coach Sunidhi saved Rishabh and Parth while coach Mika saved Parampara and Sahil. There are just two weeks left until we find out the winner of ‘The Voice India’! 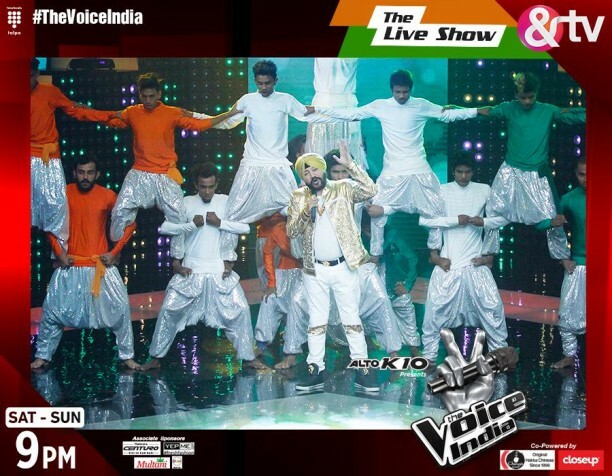 Watch The Voice India every Saturday and Sunday 9pm on &TV with written updates of the show every week at BollySpice.com! 16 queries in 1.037 seconds.